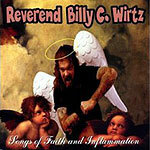 CD review: "Songs of Faith and Inflammation"
This review first appeared in the August 9, 1996 issue of the North County Times. Describe the Rev. Billy C. Wirtz? Hmmm ... let's see ... how about Jimmy Swaggart crossed with George Carlin? Bill Walton meets the Tattooed Lady? Mojo Nixon, only taller and funnier? Regardless, the right reverend, who claims to hail from Chromosome, N.C., does the best sendup of a revival meeting you'll ever hear. It's weird, raunchy Southern humor, with some of the hippest boogie-woogie piano this side of Swaggart (or even his cousins, Mickey Gilley and Jerry Lee Lewis), hillbilly jokes and plenty of references to Elvis and TV wrestling shows. You'd never confuse Wirtz for a TV preacher by looking at him, though. He's positively satanic in appearance, standing something like 6 feet, 8 inches, covered with tattoos and sporting a full red beard and shoulder-length hair. Nothing's sacred to Wirtz  starting with religion and covering everything from the National Rifle Association to political correctness. This album, his fifth, is a bit uneven. The bits recorded in front of a live audience work best; the studio stuff with a full band are, well, more clever than funny. Describe Billy C. Wirtz? The late Lewis Grizzard on growth hormones and LSD  yeah, that's it.